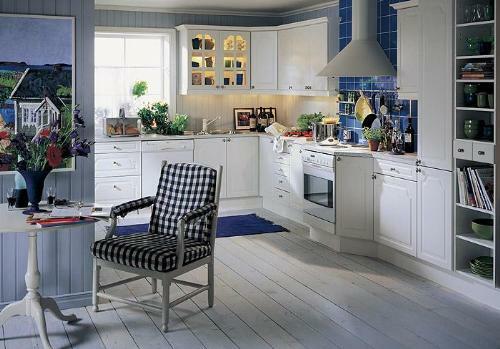 Though your kitchen is practical and functional, still you need to decorate your kitchen. It is the most important room for the person who cooks or serves food. 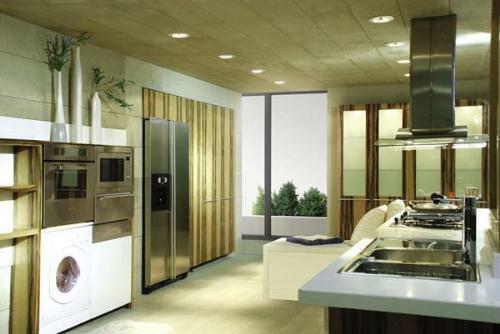 Today, we have the concept of modular kitchen which can be easily adjusted in small space as well as spacious kitchens. You kitchen would look lavish and beautiful with Top-class modular kitchens, slight consideration of architectural elements such as crown moldings, latest electrical fittings, fitted cooking appliances in single unit and latest hardware and fixtures make your kitchen the most highlighted room of your house. U-shaped kitchen: U-shaped kitchen is usually used for larger rooms. And it gives a lot of space to do workAnd much more it looks really very nice. 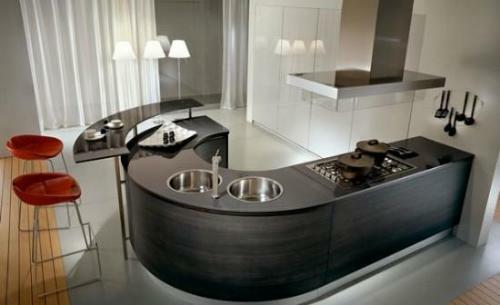 L-shaped kitchen: L-shaped kitchen can be used either medium or small. It will provide you a lot of space and you can also use the corner spaces also. 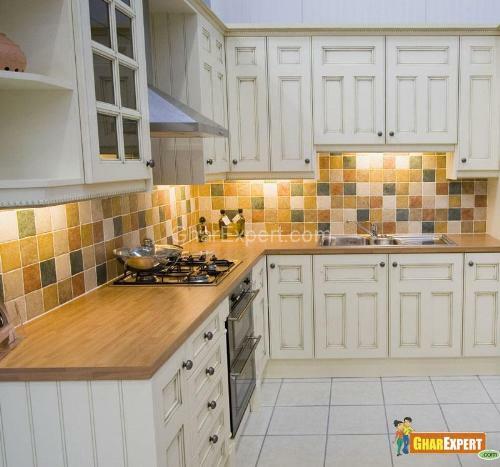 Galley kitchens: Galley kitchen is basically, a long and a narrow kitchen. And has the counters on both side of the central walk. 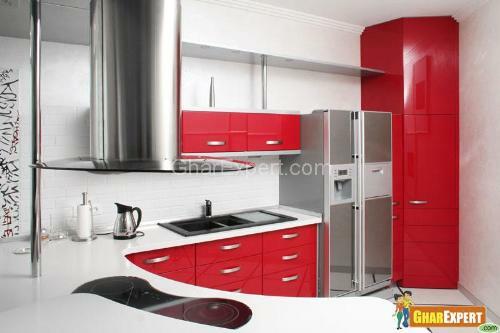 Two-way galley kitchens: Two-way galley kitchens will give you a compact kitchen. 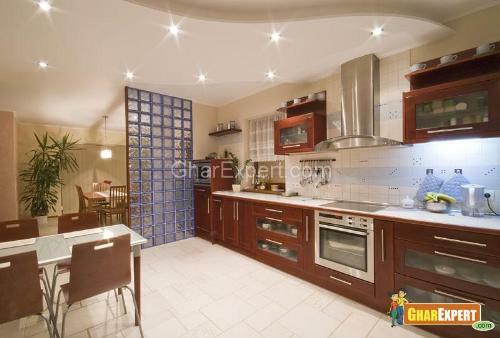 And in this kitchen you have the more storage space..
G-Shape: G-Shape kitchen is usually used for the bigger families. Multiple peoples can work together very easily. And its a very greater idea for storage space. 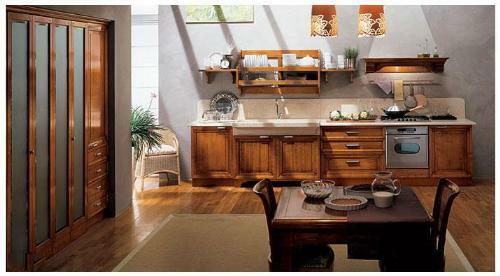 One wall kitchen: Very basic, the one-wall kitchen design is perfect for long and narrow kitchens. 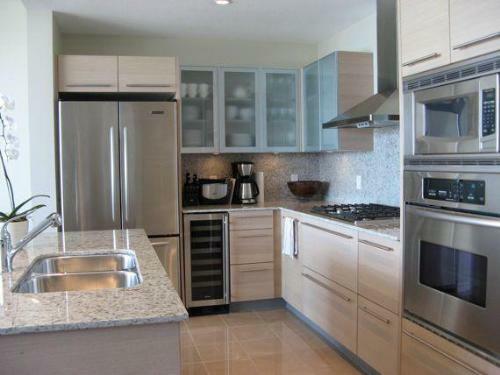 It's simple and, as far as kitchen remodels go, fairly inexpensive. While it does not utilize the classic kitchen triangle, its linear design still allows for unimpeded traffic flow. Yellow : Yellow colors give us very brightness, excitement and feel the warmer. Green : Green colors give us positive energy, freshness and relaxation. Blue : Blue produces feelings of newness, self-confidence and relaxation. Purple : Purple is a fine color in its deepest values. Red : Attracts attention, causes excitement, and even raises blood pressure. Orange : Orange is ideal for attracting attention to details. Its gives us brightness, happiness. Black : Black gives us elegance, stylishness and wealth. White : White color is the evergreen color. And gives us airy, energizing and refreshing. Feel larger room from smaller one and feel more spacious. Ceiling Fan Lighting: are very exclusive and looking very attractive, and gorgeous. Under Cabinet Lighting: are most helpful and looks amazing. Island Lighting: are very cool looking and fabulous. Pendant lighting and Counter Lighting are also very useful and attractive. Kitchen Countertops: For counter tops we can choose the different materials, such as: marble, woods, lamination, tiles, granite, stones etc. Marbles Countertops: marble can give a very different look to our kitchen and those are available in different colors and styles in the market. 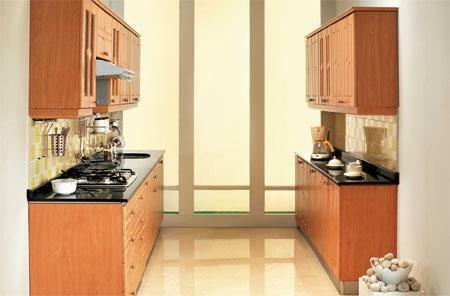 Woods Countertops: wooden countertops can also gives a very exclusive look to your kitchen. And you can also change that color time to time. Lamination Countertops: These types of countertops are very popular and inexpensive these days. And are made of layers of synthetic materials included melamine plastic coating, decorative paper, and craft paper materials. 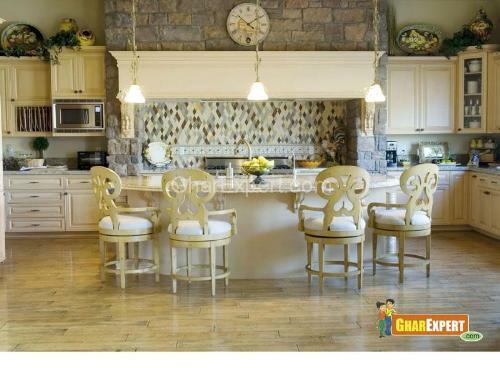 Tiles Countertops: Tiles are looks very good, And easily available in the market with many different patterns, styles, colors, and designs for your kitchen. 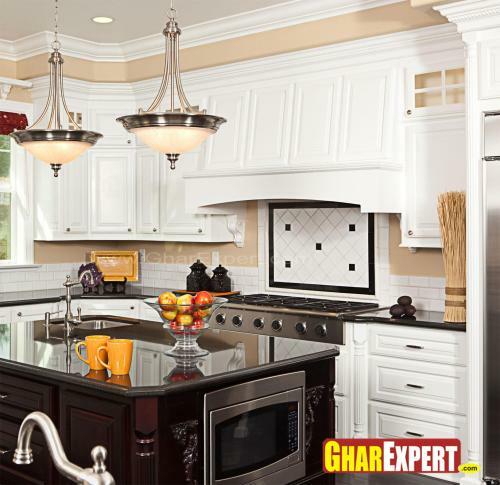 Granite Countertops: granite is the best choice for your kitchen. Because it gives a royal and rich looks to your kitchen. Its a little bit expensive from others but it would be reliable for a long term. Stone Countertops: stone countertops are looks nice but they are very heavy in weight but they are gives us a heavy duty and stronger.